As we begin the spring semester, we reflect back to the success of our students who graduated in December and welcome the new graduate students. This issue of the newsletter features stories about graduation celebrations both on the Manhattan campus and at Ft. Leavenworth and highlights awards presented to outstanding faculty at commencement. We are proud of the achievements of our graduates and extend them congratulations and best wishes for continued success in their future. The Kansas State University Graduate School looks forward to celebrateing the 50th year reunion of the class of 1965 and the 25th year reunion of the class of 1990. Masters and doctoral graduates from these classes have been invited to attend a two-day celebration at the K-State Manhattan campus on April 16 and 17, 2015. The reunion will include a variety of tours and opportunities to interact with faculty and students to reminisce about the past, see what is currently happening at K-State, and learn about future plans for the university. 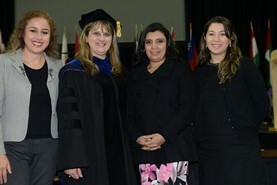 Ecuadorian dignitaries Monica Del Pilar Palacios Bernal, Geannine Claudé Alvarado Romero, and Vanessa Lucia Calvas Chávez, pictured with Debbie Mercer, College of Education Dean, attend Fall commencement. The Kansas State University Graduate School awarded approximately 194 master’s degrees and 74 doctoral degrees at the commencement ceremony held at 1 p.m. Friday, Dec. 12 in Bramlage Coliseum. The ceremony also included the awarding of an honorary doctorate and recognition of graduate faculty members receiving awards for their contributions to research and education. Kansas State University has an extensive tradition of serving those who serve to include officers attending the U.S. Army Command and General Staff College (CGSC) at Fort Leavenworth. 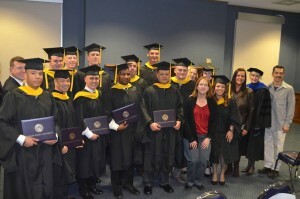 Future Army leaders are selected to attend CGSC, many of whom pursue their graduate degrees from an on-post master’s degree provider. Since 1998 over a 1000 CGSC attendees have completed K-State degrees on post. 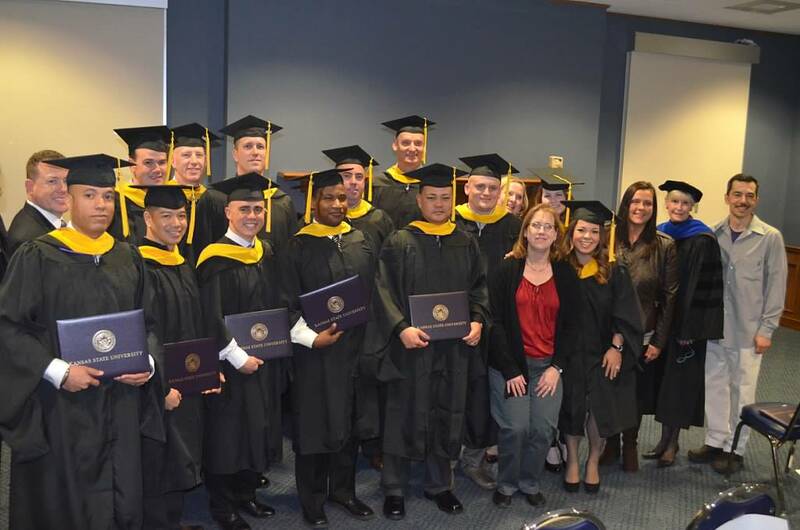 In December, the Graduate School honored and celebrated the upcoming graduation of 23 master’s degree graduates and 2 doctoral students from our Fort Leavenworth graduate programs in adult, occupational and continuing education, history and security studies.